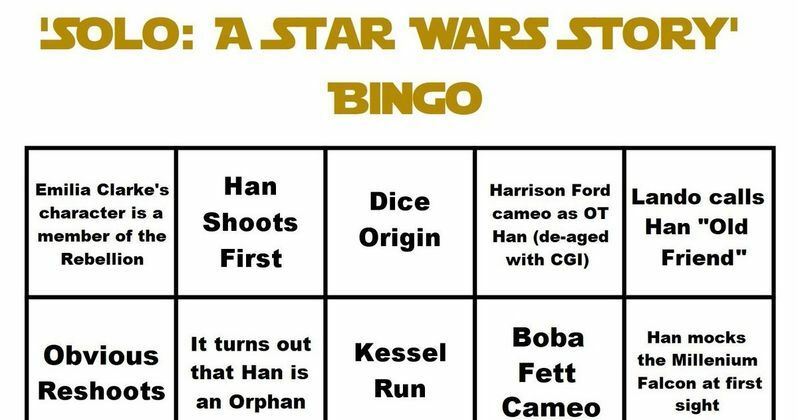 Some enthusiastic (or jaded) Star Wars fans have come up with a bingo game that serves to guess some of the more predictable moments in the upcoming Solo: A Star Wars Story. The bingo game comes as we're approaching one hundred days before the movie hits theaters. Though the movie is really close to hitting theaters, we've still yet to see any footage, or teasers, or anything really. Some fans believe that it's all on purpose, to keep all of the secrets intact, while others believe that it's still on purpose, but only because they don't think it will be very good. Some clever Redditors came up with the Solo bingo and it's definitely a labor of love or spite, it's kind of hard to tell. Some of the more humorous squares tend to be the cameos. They list Boba Fett, C-3PO and R2-D2, Greedo, and Harrison Ford. Two of those seem likely, while the other two seem a bit too far-fetched. One could easily bet that Greedo will at least make a cameo, but Harrison Ford? In the same line, the mentioning of Carbonite is brought up, so there's still quite a few ways to get a bingo win. Elsewhere, we see that the Solo movie will see Jabba offer Han a deal, we find out that "Solo" is not his real name, and we learn the origin of the dice. This Star Wars bingo is pretty spot on and one can actually see someone or even multiple people winning this bingo game. Emilia Clarke's character will be a part of the rebellion, Han will scoff at the first sight of the Millennium Falcon, Han gets his vest from Woody Harrelson's character, and Kessel Run, which we already know will be addressed. It might be a good idea to print this out, actually. The hype surrounding this latest Star Wars Story is pretty interesting to say the least. Several Star Wars fans have already written the movie off, yet they are some of the very same fans that are crying because no footage has been released. There's also a faction of fans that believe that the movie will be excellent under the direction of Ron Howard, who also cry because we have yet to see what Alden Ehrenreich looks like as a young Han Solo. Though, a new rumor claims it's coming during Super Bowl. Hype is hype as long as everybody buys their tickets to go see the divisive movie. As previously noted, we're getting pretty close to the 100-day mark to see Solo: A Star Wars Story and the excitement is getting pretty high, even for the haters who can't wait to bash the movie and secretly love it. The movie hits theaters on May 25th, and some fans just might want to make a print out of the Solo bingo to bring to the theaters with them. You can check out the original Solo bingo game over at the Star Wars Reddit Page.